They call it the "Oscars of Real Estate" awards. Aaron Ackerman, Bowers+Kubota receives the award at the 2018 World Prix d'Excellence Awards in Dubai, United Arab Emirates on May 1st 2018. Aaron Ackerman, Bowers+Kubota with the FIABCI USA Hawaii Council accompanied here by the FIABCI World President 2017-2018 Mr. Farook Mahmoud, along with former World President Danielle Grossenbacher. This Certificate of Award is presented in recognition of the above mentioned real estate development which helps to make the world a better place for live and work; it has been an esteemed example of excellence as regards to all aspects of its creation. The FIABCI World Prix d'Excellence Awards 2018 were judged by 58 Real Estate Professionals from 35 countries. The World Winners were confirmed by the Oversight Panel Meeting held in Kuala Lumpur, Malaysia on the 28th of February 2018. Founded in 1951 in Paris, FIABCI is a worldwide business networking organization for all professionals associated with the real estate industry consisting of 44 national and multinational chapters located in more than 65 countries, 87 professional associations, 79 academic institutions, 13 public institutions, 2,300 regular members and 1,000,000 associate members. World Leaders from 65 different countries across the globe gather at the International Real Estate Federation (FIABCI) 69th World Congress in Dubai, United Arab Emirates on April 30th, 2018. FIABCI is the most representative non-political organization of the real estate industry in the world. FIABCI Community gathers stakeholders of the real estate industry representing over 40 professions including: Architects, Brokers, Developers, Investors, Managers and other various Experts. FIABCI, a spirit of business community to share and inspire best practices Worldwide. FIABCI is the most represented non-political organization of the real estate industry in the world. For about 70 years FIABCI has provided access and opportunities for real estate professionals interested in gaining knowledge, sharing information and conducting international business with each other. On May 31st 1996 FIABCI obtained special consultative status as the Economic and Social Council (ECOSOC) of the United Nations, dedicated to sustainable development, providing overall guidance and coordination. Called the "Oscars of Real Estate" this unique award is given to the real estate projects that embody excellence in all disciplines involved in their creation. With support from the Wall Street Journal, the international award is an affirmation of the FIABCI ideal of providing society with optimal solutions to its property needs and helping make the world a better place to live, work and enjoy. The award even looks like an Oscar! Aaron Ackerman receives National Award from the International Real Estate Federation (FIABCI) for most outstanding real estate development project of the year in 2017. The Grand Prix of Real Estate is an award that recognizes the BEST of the BEST out of all real estate category winners honored Nationwide by the annual competition. Developer Aaron Ackerman of Bowers+Kubota was recognized for the development of the first living building residence in the World to be built nearly exclusively from regional waste stream material while delivering a high-performance building designed to operate beyond net-zero on an annual basis. Executive Director Edwin Hawkins from the Office of Economic Development with the City and County of Honolulu presented the award to Aaron on March 29th at the IBM building in downtown Honolulu. Also pictured beside Aaron Ackerman are Judy Sykes (Council President) and Jeff Lau, both Board Members of the FIABCI - Hawaii Council. “FIABCI-USA” International Real Estate Federation - U.S. Chapter is a business network of real estate professionals world wide. With members in 65 countries, including 100 Professional Associations, 56 Academic Institutions and 3000 individual members from all professions of the real estate sector, FIABCI is the most representative organization of the real estate industry in the world and holds special consultative status with the Economic and Social Council (ECOSOC) of the United Nations. From left to right: Judy Sykes (FIABCI Hawaii Council President), Jeff Lau (Event MC), Aaron Ackerman (Architect Bowers+Kubota), and Edwin Hawkins (City and County of Honolulu). Aaron Ackerman of Bowers+Kubota alongside other Hawai'i Innovators being honored by the Hawai'i State Senate on March 12th, 2018. 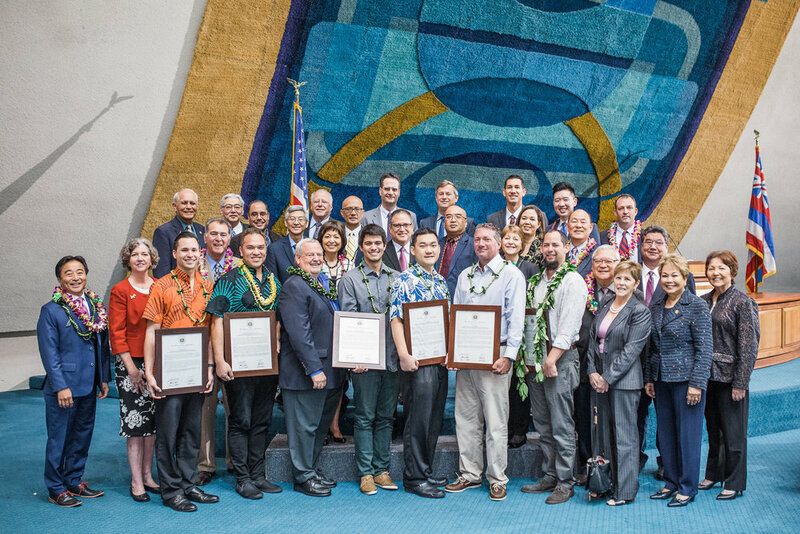 Bowers+Kubota Sustainability Architect Aaron Ackerman (4th from bottom right) pictured here with other Hawai'i Innovators being honored by the Hawaii State Senate on March 12, 2018. Aaron Ackerman, of BOWERS+KUBOTA awarded 2018 Island Innovator of the Year by the Hawaii Venture Capital Association for the Living Building Challenge demonstration project. This award is to honor the most impactful innovation that has helped our island state – truly solving a problem in our own backyard, our mountains, our beach, our aina. This innovation inspires and celebrates an innovation, entrepreneur or company that has shown leadership and commitment to tackling a significant problem in our state. This year Aaron demonstrated by example the 1st Living Building to be built from 75% regional waste streams and is a role model residence in the State of Hawaii embracing Regenerative Building Design concepts while showcasing an Architecture with Reverence to Place. Regional and cultural priorities shape the building’s design. Regenerative buildings are buildings that become an integral part of their ecosystem. Regenerative buildings return more to the land than they consume and remediate the site in the process. The project is registered under the most difficult green building rating system in the World, called the Living Building Challenge (LBC). Exceeding the LBC’s standards, this living building could only be built with regional waste streams extracted exclusively from the Hawaiian Islands…. essentially Hawaii’s construction waste headed for the landfill, incinerator or in some cases even shipped back to the US Mainland for another State to manage. Any new building materials used in the project underwent the most stringent materials vetting process used in the building industry today before they could be included in the project. Working with the State of Hawaii Department of Health, Aaron installed the first Pilot Project Case Study in the State of Hawaii to recycle 100% of its greywater and blackwater discharge from the building's sewer system where a city sewer lateral is available to the parcel. This is accomplished through an on-site aerobic treatment unit (ATU) that stores and treats the wastewater before irrigating sub-surface non-edible landscaping beds. The water can be used up to 3 times before it irrigates a plant. As an added safety measure, a soil moisture meter informs the system when moisture levels exceed allowable rates and diverts treated wastewater back into the city municipal sewer system. In this way, technology and engineering demonstrate a safe way to accomplish net-zero water strategies while working with the City’s existing infrastructure. Aerobic treatment unit technology is a clear alternative to septics and cesspool pollution. The goal of the project was to engineer a safe, predictable and proven strategy for achieving net-zero wastewater strategies in the built environment which the State could utilize as a privately funded case study to push the conversation forward. Visit HVCA to learn more about the Island Innovator of the Year Award. Meli James (HVCA President) and Rich Wacker (American Savings Bank President and CEO) present the 2017 Island Innovator award to Aaron Ackerman of Bowers+Kubota on March 1st, 2018 at the Waialae Country Club. 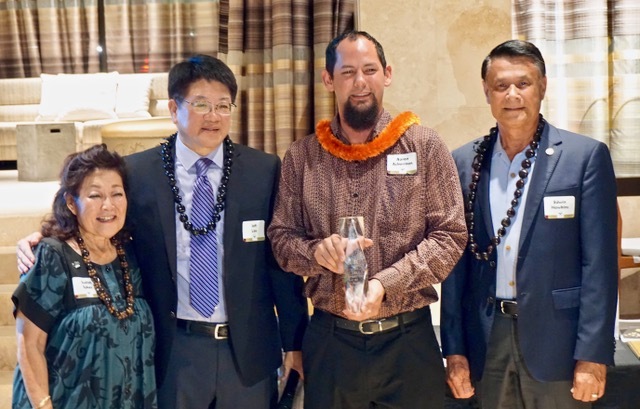 Pictured from left to right at the HVCA Awards: Aaron Ackerman (B+K Architect), Jessica Ackerman, Dexter Kubota (B+K President), Mary Kubota, Duane Kashiwa (Hawaii DOE). Photo: Brant Ackerman (Aaron's father) pictured with Aaron as he received the HVCA Island Innovator of the Year Award for 2017. FIABCI-USA, the International Real Estate Federation – US Chapter is a multi-discipline, networking organization for all professionals associated with real estate transactions. With members in more than 50 countries and the World, FIABCI organizes Regional and National Congresses throughout the year. FIABCI also enjoys Special Consultative Status with the Economic and Social Council of the United Nations. Awards are based on projects' overall merit and evaluated by an international panel of real estate professionals and experts. Projects were evaluated on their plan of development, financial success, environmental impact and benefits to the community. Visit FIABCI USA to learn more. The Grand Prix of Real Estate seeks to showcase the best projects in the USA and built by US builders around the world.